-Backpack is made of double waterproof nylon fabric. -The fabric is thick and strong enough. Not easy to scratch ortear! -The inner fabric is also strong and durable! They can last a longtime. SKY TREE Backpack have a perfectcompartments design, large storage space. -They can fit all of your accessories! 1, Such as clothes, shoes, power bank, phone charger, wallet, keys,and some small things. 2, Perfect for sports, gym, yoga, golf, workout, fitness, danceand travel. Perfect Multiple Compartments-Main Pocket area for all your yoga and gym gear. Front cargo pocket for added storage and convenient access. 2 additional zipper pouches for valuables. Includes the right side yoga mat compartment. Best Quality & Comfort Design- Durable,waterproof nylon mat bag adjustable mat buckle strap system that fits yoga mats up to 7 pounds.Compact balance packaging design suitable for daily use. 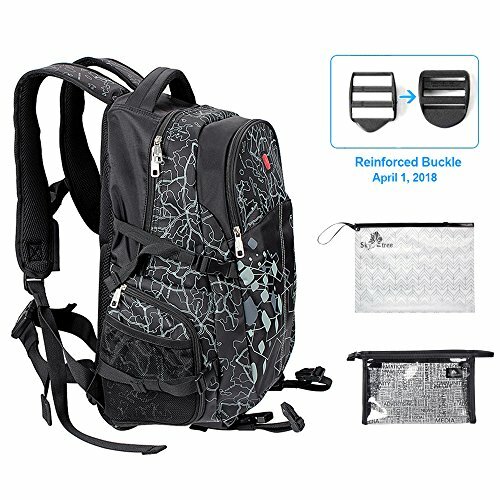 Multipurpose Sports Backpack - Take it to the gym, school, yoga or Pilate class, use it for travel, or even take it hiking; this bag can hold it all. Special Separated Pockets-The two additional bag are more convenient for some sports necessities, Or something else such as storing your skin care products, cosmetics, towels, etc. Lifetime Warranty-When you order this running bag you are fully protected by our 100% lifetime warranty. Feel free to contact us if you have any question. If you have any questions about this product by Sky tree, contact us by completing and submitting the form below. If you are looking for a specif part number, please include it with your message.